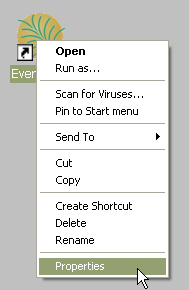 To have preset tabs waiting when Evergreen opens you will need to modify the Evergreen shortcut on your desktop. First, you need to copy your shortcut. There are a couple of ways to do this. Right-mouse click and drag icon; upon release select Create Shortcut Here. 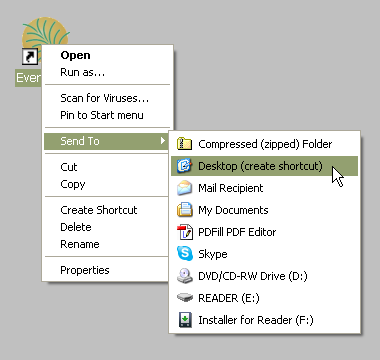 Right-mouse click icon, select Send to, and select Desktop (create shortcut). Right-mouse click the new shortcut and select Properties. 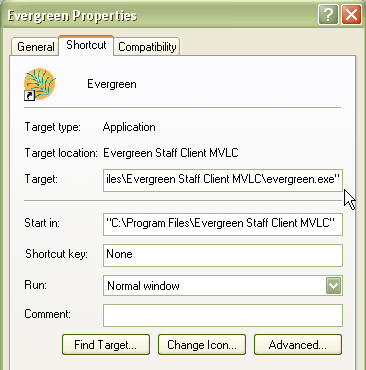 Listed in the Target box you will see something like the following path surrounded by quotation marks: "C:\Program Files\Evergreen Staff Client MVLC\evergreen.exe"
Place your cursor after the ending quotation mark. Enter a space after the last quotation mark and then enter the tab code from the list below. Add multiple tabs with a space separating them. You may want to rename your shortcut to reflect its purpose. For example, you could have one icon set to open circulation-related tabs and one icon to open cataloging-related tabs. Right-mouse click and select Rename to do this.